Hosting an outdoor dinner party and not sure how to transform your space? 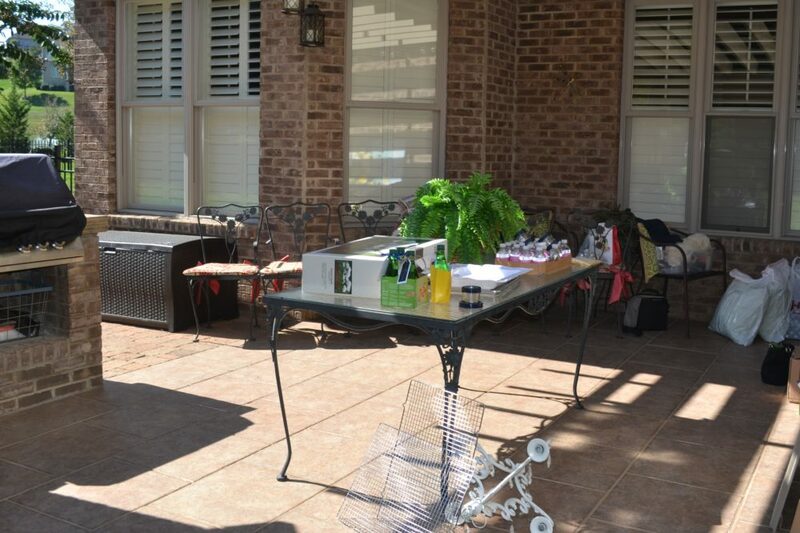 Check out these before and after photos of an outdoor dining space. 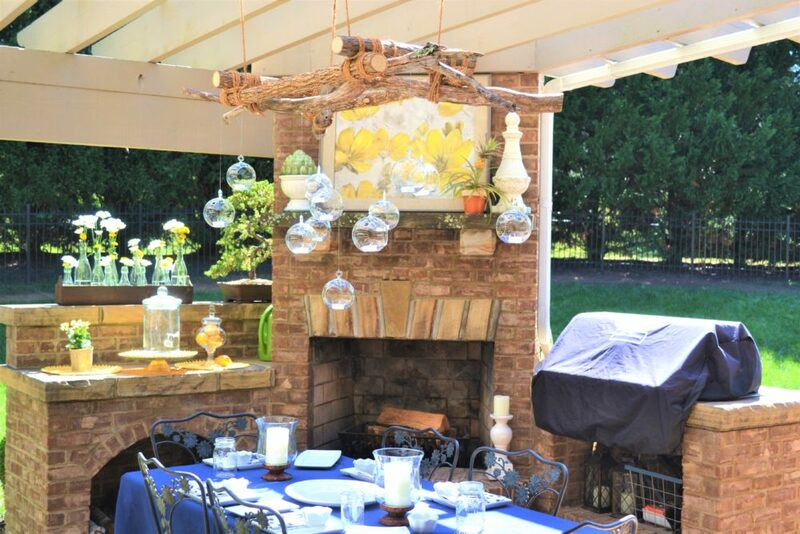 The outdoor dining space began with neutral brick and was transformed with navy, white and yellow color scheme. The client wanted to create a low country boil for a Saturday night Supper but wasn’t sure how to put it together or where to start. We started at the beginning with the menu, and over all navy, white and yellow color scheme. Next we selected the outdoor dining space. Here is the inspirational mood board for the dinner party. This is a beautiful space with neutral brick and corner fireplace with mantel. The only thing missing was an overhead lighting system, so we created a Do it yourself styled candle globe overhead chandelier. The wrought iron table was the perfect size for the dining event which seated 6. We transformed the dining chairs and set the table in the new color scheme, navy, white and yellow. The opposite wall which you can not see in this photo is solid brick. We added a colorful yellow and white floral canvas to the wall and placed a long skinny buffet under the print. This buffet held the beverages and take home favors. 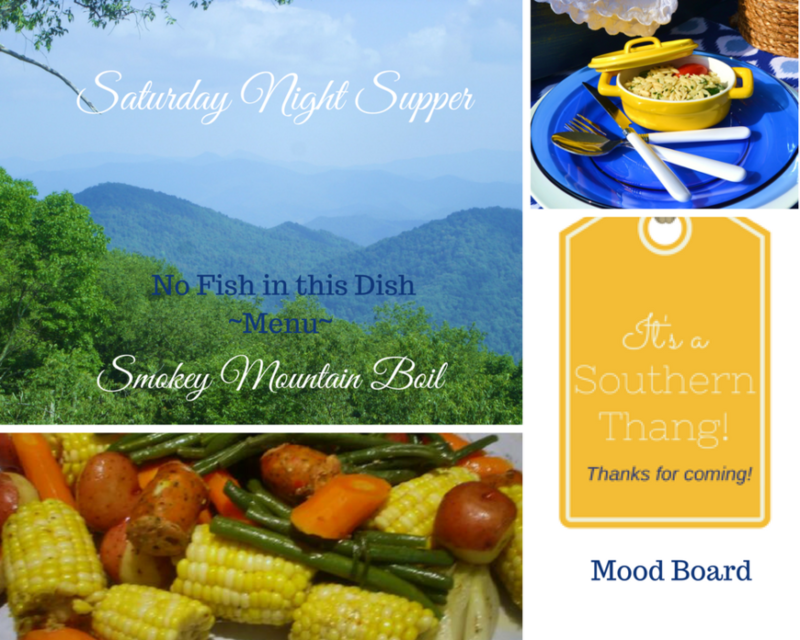 The overall decorating theme was directed by a smokey mountain boil, aka low country boil but with out fish in the dish. Cloth Shower curtain turned navy table cloth. DIY Over head chandelier made from small branches and tied with rope to secure ends. Glass orb’s were filled with fresh yellow corn and votive candle and hung with fishing line. Corn kernels were used in candle vases on table as well as the chandelier. Floral yellow and white wall canvas was hung on mantel of fireplace to bring in the yellow and white color scheme. Several glass floral vases with white daisies and yellow centers on side bar. 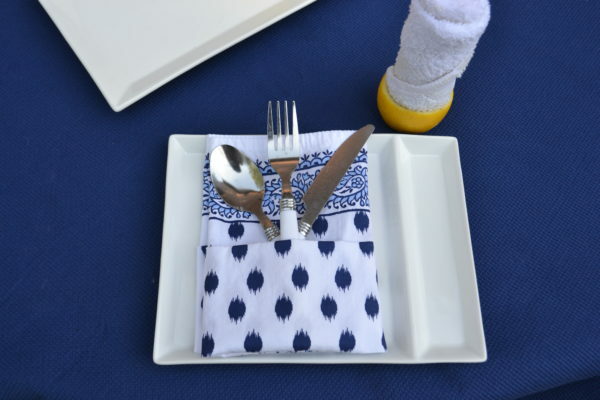 Navy and white napkins were folded on plates to hold flatware. 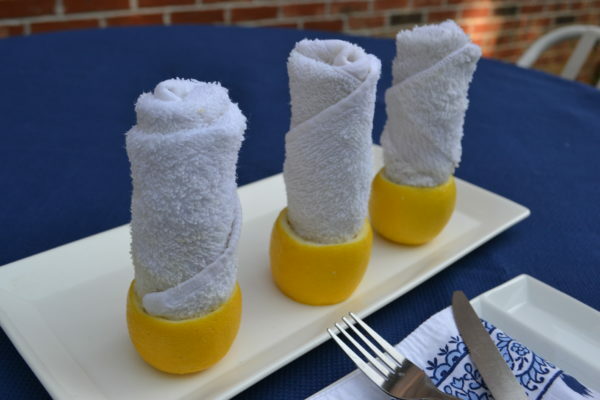 Lemons were cut to hold wet wash cloths as finger bowls. 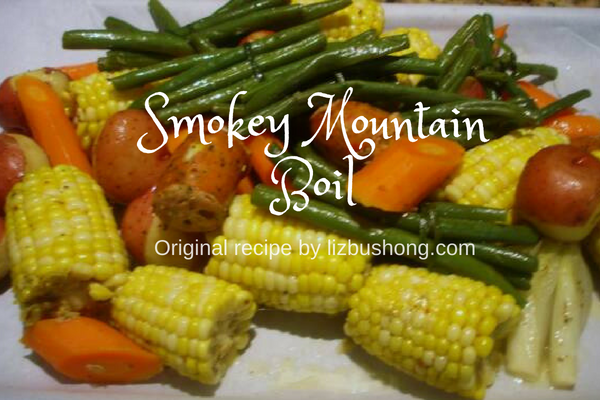 The table centerpiece was the main dish, Smokey Mountain Boil.